Thanks to Fujitsu, we have seen broad-ranges sensor-related talks and panels at "Fujitsu Laboratories of America Technology Symposium 2013". Here, we had various talks related to "Smart Homes", "Smart Healthcare", and "Smart Driving" technologies as you can imagine, but those are actually prominent so that I wasn't that surprised by those ideas. However, there were at least one interesting idea in progress, about "Smart Parking" for all folks in metropolitan areas. Jay Primus, a Program Manager from SFpark presented their approaches to maximize the values and utilization of the public parking garages and places in downtown of San Francisco. First of all, let's start with the existing problems in metropolitan areas like SF. What are the problems? From a driver's perspective, it is hard to find a right place to park in right time, or should pay too expensive cost to park in expensive places. From a metropolitan parking manager's perspective, there are unnecessary traffic in downtown hot spots due to waiting vehicles to park, and/or illegally parked vehicles., even though there are available places to park in another places. So, let's see how they work. To the best of my understanding, it can be explained into four pieces; 1) Road sensors, 2) Data acquisitions, 3) Data analytics, 4) People's engagement. 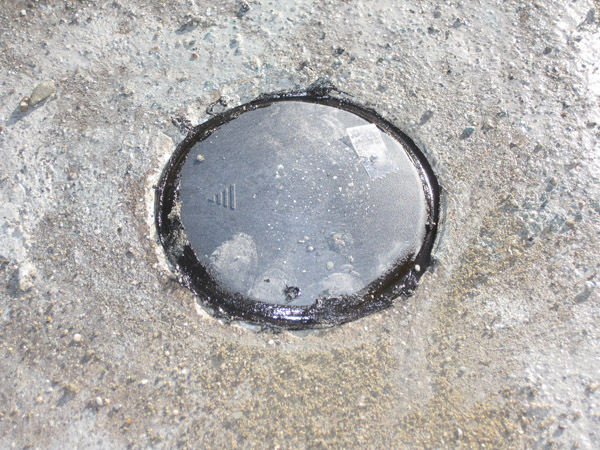 In 2010, SFpark started to deploy "parking sensors" on the road to know whether if each place is occupied or not. Specifications of the sensors are available at the SFpark website, but in brief, the sensors work 24/7 in real-time, so that the central parking management system. Even though, we may still have false-positives or false-negatives, it would be very essential one. Including aforementioned road sensors, we can capture more data from the traffic congestion management system, from parking structures, from vehicles, or even from people's mobile phones. The presenter, Jay Primus mentioned that SFpark will publicly provide those massive amount of live streaming data on their website for businesses and developers (as a JSON format). 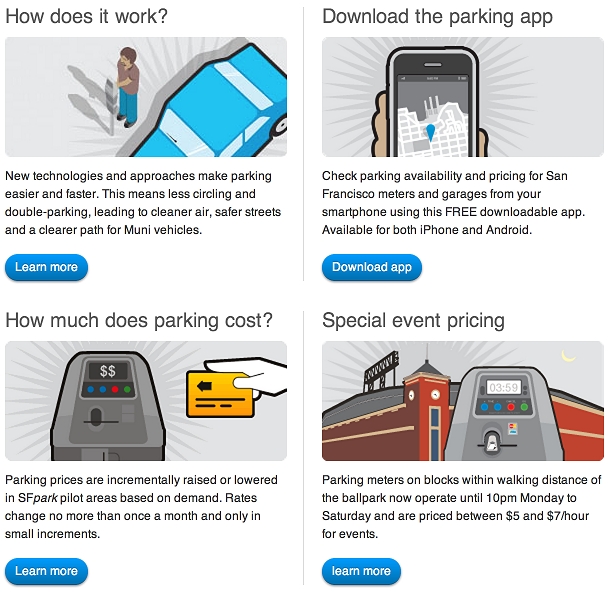 Based on above massive amount of data, what SFpark needs to do is, performing a quasi-real-time data analytics, to appropriately adjust the parking cost appropriately; in other words, they do a "demand-based pricing" based on the current traffic status and the occupancy status of the parking places. The last but not least (I always double check when writing this quote, because I have seen some French people said "The least but not last"), we need to intervent people to change their usual behavior and get people to engage into the new parking system. First, the new parking system should provide an easy way to find a place to park. 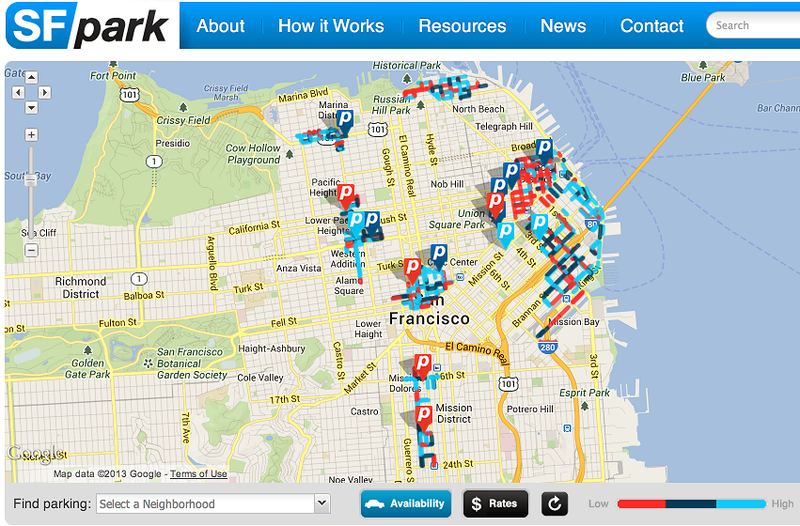 To do this, SFpark provides a mobile phone application showing nearby available parking places. Another possible way is to integrate the application into the navigation and/or IVI(in-vehicle-infotainment)-like services. Thanks to SFpark's publicly opened data, we can try to do this with various ways. Second, aforementioned, the new parking system adjusts the parking costs based on the dynamic demand-supply relationships. This means that, the system should also be able to notify the current (updated) parking costs on various places to the people, so that people will select by themselves. In this situation, most of parking signs statically written (carved in stone) and installed in places should be replaced with digital screens. Third, the system can even change whole people's behaviors by suggesting the best way to move to some places. This requires more collaborations with the metropolitan transportation systems (e.g., Caltrans), and with few more municipal agencies, but it will definitely save significant amount of people's time on driving and parking. For example, SCSN (Stanford Center for Societal Networks) in Stanford University did a work related to decongesting commuting traffic, and they showed that they can save few thousands person-hours during a few months in a medium-size company. In short, what we need is neither a yet another sensor technologies, nor too fast data analytics sciences. But what we need is to keep moving forward to connect existing technologies to work together, and do more agile development and deployment to change the real world. In other words, we don't just hope to live in a better world, but act something to change the world. Then, let's keep moving forward, towards a yet-another parking experiences in metropolitan areas!